Our pretty collection of snowflake patterns for cross stitch accented with seed beads. 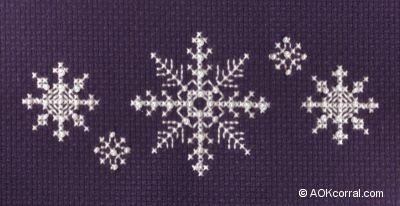 The Easy Print Version contains all cross stitch snowflake patterns and instructions. BONUS: This version contains Snowman w/snowshoes pattern. Finished Snowflake design measures 5 inches wide and 2 inches high. Stitch count is 69 stitch wide and 27 stitches high. Stitch these snowflakes onto pillowcase edges, table runners, linens and more! © Copyright 2011 by AOK Corral Crafts. All rights reserved. *This version includes the snowflake patterns and the Snowman w/Snowshoes Design.